To See the most recent information visit my blog with happenings with my birds and life in general. I live in Southwestern Montana and keep a small flock of chickens. They are kept for eggs, summer for grasshopper control, and of course ammusment. Here is our 1st coop. 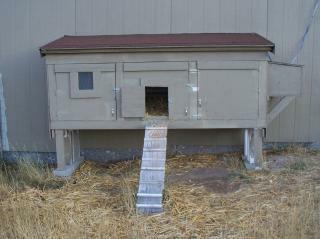 It was designed to allow the chicks to keep themselves warm, but also ease of cleaning. Originally I got 8 chicks with plans to keep on 3 or 4. I would only end up keeping 2! You can slide a muck bucket under the open door and scoop out the joint. In a coop this small, you do need to plan to clean it regularly. It is lined floor and walls with white vinyl flooring to make it easy to clean and reflect as much light as possible. We are now onto our 2nd coop, larger than this. That is a different story more on that later.